Oxypetalum coeruleum is a species of flowering plant, native to South America from southern Brazil to Uruguay, in the Apocynaceae family. The synonymous name Tweedia caerulea is also used. Growing to 100 cm, it is a straggling evergreen perennial with heart shaped, gray-green, downy leaves. 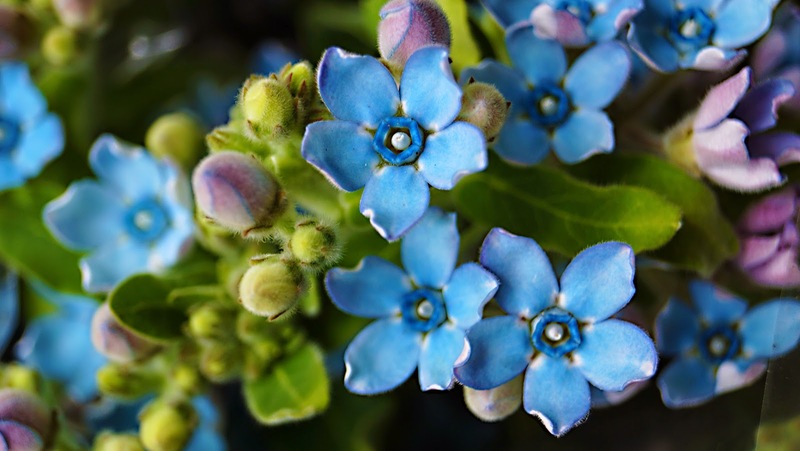 It is grown for its clear pale blue, star-shaped flowers, which are long lasting and cut well. The summer flowers age to purple and are followed by 30 cm long, boat-shaped seed pods. The seeds have downy parachute-like tufts (cypsela). The cultivar 'Alba' has white flowers, while 'Rosea' has pink flowers. Oxypetalum coeruleum requires full sun in a well-drained soil that is dry. Propagation is via seed. With a minimum temperature range of 3–5 °C, it can be grown outdoors in a frost-free, sheltered environment. Alternatively it can be grown as an annual. This plant has gained the Royal Horticultural Society's Award of Garden Merit. What a pretty flower and such a nice blue! These flowers are so beautiful!! I have coveted this flower for years. Lusted after it one might say. Those waxy flowers in that irridescent light blue.....Wish I could find it one day to grow in the greenhouse. Fascinating, and a beautiful photo as always. I didn't see a size of the flower. Are they tiny or what? Thanks for hosting, Nick. Wonderful blue tiny flowers. Amazing ! what wonderful little blue blossoms, I love them! I wish you a nice friday and a pleasant weekend! How wonderful! It looks as though it's made of china!